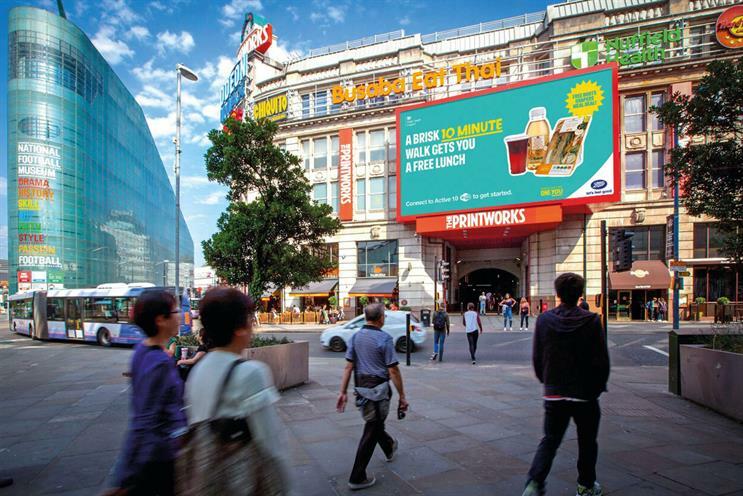 Public Health England has unveiled an interactive campaign in which adults who walk briskly from an out of home ad site to a Boots store within ten minutes are rewarded with a free Shapers Meal Deal. The initiative, created by 23red and part of PHE’s integrated "One you" physical activity campaign, involves people downloading the free One You App via Ocean Outdoor’s wi-fi-enabled large format ad screens. The app gives them the route to a participating Boots store and a voucher with which to redeem lunch – if they make it to the shop within ten minutes. The full motion screens in Leeds, Newcastle, Manchester and Birmingham city centres will show pictures of participants who use the #Active 10 hashtag. The ad was a winner last year in Ocean and Campaign’s annual creative digital competition which fosters bold ideas in digital out of home. Ocean has worked with 23red and production company Jolly Good Digital to bring the concept to life. "Active 10 is here to encourage people to take small steps towards exercising more," said Helen Hampton, director of partnerships at PHE. "23red have really captured the essence of the initiative that ten minutes of brisk walking can easily fit into a lunch break and being more active doesn’t need to mean wearing lycra or investing in expensive membership. This is also a fantastic example of working with the right partners to bring a ten-minute walk to life." Sean Kinmont, creative director at 23red, said: "By giving people a ‘call to action’, they are much more inclined to fully engage with the initiative and make a positive change to their lifestyle." Helen Haines, Ocean’s head of marketing, said the idea was a competition winner because it "encourages adults to be more active, it’s localised and it engages with individuals, reflecting the active role large format digital out of home plays at a community level." The ads on the full motion wifi-enabled city centre screens are supported by teaser ads across neighbouring Ocean locations. Entries for Ocean and Campaign’s digital creative competition close today, 8 September, and the winners will be announced on 5 October. Childhood obesity strategy one year on: has it whipped brands into shape?